Every driver of a powered industrial truck needs to understand certain mechanical truths, including the vehicles center of gravity, balancing the load properly, and special driving requirements on inclines or into confined spaces. Equally important is the drivers focus on safety. 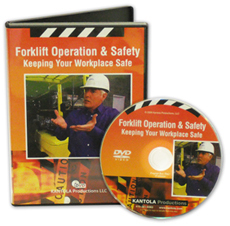 This video emphasizes an awareness of forklift driving hazards and promotes best-practices that help maintain an accident-free workplace. Forklift Operation & Safety was designed to address the training needs of forklift operators with any level of experience by covering proper forklift safety procedures, as required by OSHAs 29 CFR Section 1910.178(I). Forklift Operation & Safety is guaranteed. We want you to use this valuable resource and put its safety information to work in your department. Then, if you are not 100% satisfied, you may return it within 30 days for a full refund.